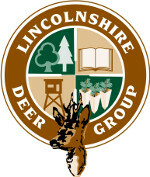 Lincolnshire Deer Group | "Promoting a co-ordinated approach to the sustainable management of Lincolnshire’s wild deer"
Deer are an important part of our wildlife and are attractive animals which people enjoy seeing in our countryside. However, when populations increase they can cause serious damage to woodlands, farm crops, nature reserves and even private gardens. Six species of deer have been recorded in Lincolnshire, they are, Red, Roe, Fallow, Muntjac, Sika and Chinese Water Deer, Fallow and Muntjac being the most numerous. Populations and range are increasing throughout the county and it is anticipated that England’s wild deer population will double over the next ten years. From the early 1990’s the Deer Initiative has encouraged the formation of local Deer Management Groups whose aims are to achieve the sustainable protection of woodlands and other wildlife habitats whilst maintaining desirable and healthy wild deer populations. Formed in 1997, the Lincolnshire Deer Group seeks to raise the awareness of wild deer issues and is able to offer wide ranging practical deer management advice to woodland owners and land managers in the county. Membership of the group is varied and includes private estates, farmers, Natural England, Lincolnshire Wildlife Trust and others. Wild deer have no boundaries and are a landscape issue that must be addressed by all land managers working together. They are rarely afforded the priority they deserve, often seen, quite wrongly as merely a field sports issue. Our website is intended to give an overview of the Lincolnshire Deer Group, its activities, the county’s deer and related deer management issues.